Especially designed for individual visitors from Mainland China; a Street Map and a Guide Booklet are included, simple and convenient. 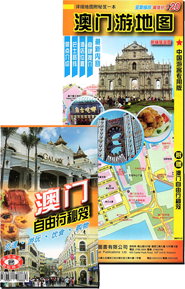 The Street Map covers the town of Macau, Taipa and Coloane, with bus routes and stations. The Guide Booklet include color photos with detailed description of the Macau transportation system, famous historic sites including museums, artillery fortresses, churches, temples and parks… also include hotels, dining places and a street index. This publication is in Simplified Chinese.